(from Wikipedia, the free encyclopedia) The Ford Torino is an intermediate automobile produced by the Ford Motor Company for the North American market between 1968 and 1976. The car was named after the city of Turin (Torino, in Italian), which is considered the Detroit (primary automobile production city) of Italy. The Torino was initially an upscale version of the intermediate sized Ford Fairlane, which Ford produced between 1962 and 1970. After 1968, the Fairlane name was retained for the base models with lower levels of trim than those models which wore the Torino name. During this time, the Torino was considered a subseries to the Fairlane. By 1970 Torino had become the primary name for Ford's intermediate, and the Fairlane was now a subseries of the Torino. In 1971 the Fairlane name was dropped altogether and all Ford intermediates were called Torino. This name was one of several originally proposed for the Mustang while in development. The Torino was essentially a twin to the Mercury Montego line. Most Torinos were conventional cars, and generally the most popular models were the 4-door sedans and 4-door hardtops. However, Ford produced some high-performance versions of the Torino by fitting them with large powerful engines, such as the 428 cu in (7.0 L) and 429 cu in (7.0 L) "Cobra-Jet" engines. These cars are classified as muscle cars. Ford also chose the Torino as the base for its NASCAR entrants, and it has a successful racing heritage. For 1972, the Torino was redesigned using many characteristics carried over from the previous generation. The 1972 Torino styling emphasized the "long hood short deck" look as well as coke bottle styling more than ever before. The most radical change was a large eggcrate grille in an oval opening on Gran Torinos. Tom McCahill, stated "the gaping grille looks a little like it was patterned after Namu, the killer whale", but also stated that the Torino had "kind of pleasing, no-nonsense styling." Gran Torinos had chrome bezels surrounding the headlamps, while base Torinos had a full width argent eggcrate grille that surrounded the headlights. Base Torinos also used a unique hood and front bumper. The Torino's front fenders were aggressively flared, the rear fender line swept up towards the roof, and the windshield had a 60-degree rake. The A-pillars and roof were thinner, although the structural integrity remained the same as 1971 models. The rear featured a full width bumper that incorporated thin rectangular tail lights into each bumper end. Window glass was frameless for all models and vent windows vanished from four-door and station wagon models. All Torinos had "DirectAire" ventilation as standard equipment. The Torino incorporated new safety features for 1972, including new flush mount door handles and side door guard rails. The number of models was reduced from 14 models in 1971 to 9 in 1972. The convertible was discontinued, and the 4-door hardtops and sedans were replaced with 4-door "pillared hardtops." 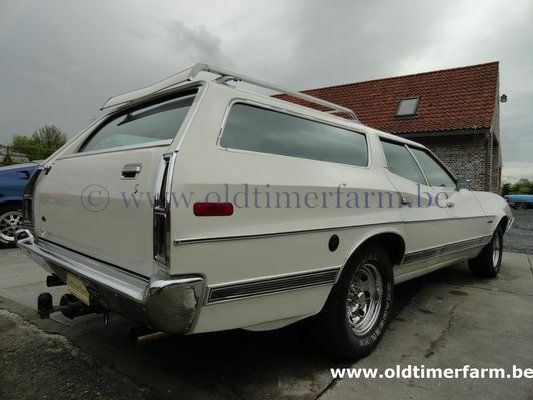 This was Ford's term for 4-door sedans with frameless door glass. All other body styles remained, including the fastback, which Ford continued to dub "SportsRoof". "Torino" remained the base series, but the mid-level Torino 500 was renamed "Gran Torino". The Torino Brougham was reduced to an option package for the Gran Torino, and Torino GT became "Gran Torino Sport." The Torino and Gran Torino were available as a 2-door hardtop and a 4-door sedan; the Gran Torino Sport was available as a 2-door hardtop and SportsRoof. The station wagon line-up consisted of three models: "Torino," "Gran Torino," and "Gran Torino Squire." The Cobra model was discontinued as the Torino line was refocused toward luxury and de-emphasized performance. The biggest change for the Torino was the switch to body-on-frame construction from the unit-construction of the 1971 models. The new chassis was a perimeter design that was used to help give the Torino a quieter and more isolated ride. It featured an energy absorbing "S" shaped front end, torque boxes to isolate road shock, fourteen rubber body mounts and five solid cross members. The front suspension used an unequal length control arm design, with a computer selected coil spring mounted on the strut stabilized lower control arm, much like the fullsize Ford LTD. The rear used the "Stabul" four link suspension with a computer selected coil spring mounted on a solid axle. The new suspension and chassis had a wheel track at least 2 inches (51 mm) wider than the 1971 models. Motor Trend stated the "road isolation and vibrational dampening is superb" in its test of a 1972 Gran Torino Brougham 4-door. Ford offered two suspension options, the heavy-duty and competition suspension. The heavy-duty suspension included heavy-duty springs and shocks, while the competition suspension included the heavy-duty springs and shocks, plus a larger front sway bar and a rear sway bar. This was the first year that a rear sway bar was offered in the Torino. Front disc brakes now became standard on all Torinos, which no other American intermediate (other than the Mercury Montego) offered in 1972. Power brakes remained an option for sedans and coupes under 429 cu in (7.0 L); they were standard on all station wagons and 429-powered models. The power steering was also revised to be integral in the steering box, rather than the external booster style used in previous years. All Torinos now had 14-inch wheels as the only wheel size available, while 15-inch wheels were used for police and fleet models. The other major change for Torino was separate wheelbases for both 2-doors and 4-doors. Starting in 1968, GM had begun to use a smaller wheelbase for its 2-door intermediates, and a larger one for the 4-doors. This allowed for stylists to make fewer compromises when trying to turn a 2-door into a 4-door. Chrysler also followed suit in 1971, although its intermediate coupes and sedans didn't even share body panels. The 1972 Torino used a 114-inch (2,896 mm) wheelbase for 2-doors and a 118-inch (2,997 mm) wheelbase for 4-doors, station wagons, and its sister vehicle the Ranchero. Like GM intermediates, the Torino 2-door and 4-door still shared many body parts. Overall, the size and weight for Torino had increased for 1972, following the longer, lower, wider trend. Gran Torino sedans saw a 5-inch (127 mm) length increase, while 2-doors only had a 1-inch (25 mm) increase in length. Interestingly, base Torino sedans were only 1-inch (25 mm) longer, and 2-doors were actually 3-inch (76 mm) shorter than 1971 models. Weight increased significantly for 4-door and station wagon models, while 2-doors had a smaller increase in weight. The base engine was the 250 cu in (4.1 L) I-6 in all models except station wagons and the Gran Torino Sport which had a 302-2V small-block V8 as standard. Available engines included the 302-2V, a 351-2V "Windsor" or "Cleveland", a 351C-4V "Cobra Jet" (CJ), a 400-2V, and a 429-4V. The 400-2V was a new engine to the Torino line-up, and was part of the 335 series engine family like the 351 Cleveland. The 429-4V was not a high-performance engine like the Cobra Jets of previous years; instead, it was a high torque, low revving engine. Emissions, low lead requirements and fuel economy requirements had begun to take their toll. The compression ratios on all Torino engines were dropped to at least 8.5:1, and all engines ran on regular gasoline. These engines produced less power than their predecessors in 1971, although this was exaggerated due to the switch to the new SAE net bhp ratings from the SAE gross figures used in 1971. All models were equipped with a three-speed manual transmission as a standard feature. The Cruise-O-Matic remained optional, but was a mandatory option for the 351-2V, 400-2V and 429-4V. The 351-4V CJ required either the 4-speed or the Cruise-O-Matic as mandatory options. With the only performance engine being the 351-4V CJ, performance was no longer at the "super car" levels of the old 429 Cobra Jet Torinos. The 351-4V CJ was new for 1972 and offered a number of performance enhancing features not offered on the 1970–71 351C-4V. It included a special intake manifold, modified camshaft, special valve springs and dampers, a 750 CFM Motorcraft Carburetor, 4-bolt main bearing caps and 2.5-inch (63.5 mm) dual exhaust. The 351 CJ was the only engine equipped with dual exhaust and it was the only engine that could be mated to the available four-speed transmission. The Ram Air induction system was still available, and could be equipped on 351 CJ and 429 powered cars. Performance with the 351 CJ was still good though, and Car and Driver tested a 351 CJ, 4-speed Gran Torino Sport SportsRoof with 3.50:1 gears to have a 0 - 60 mph (97 km/h) time of 6.8 seconds. Car and Driver did not publish its quarter mile times, but Cars magazine tested a Gran Torino Sport SportsRoof with a 351 CJ, C-6 automatic, and 3.50 gears to run though the quarter mile in 15.40 seconds. Interiors were all new and featured a vastly improved instrument panel, that used ABS plastic for much of its construction. The standard instrument cluster featured five equally sized round pods and contained a speedometer, fuel gauge, and temperature gauge, along with various warning lights. The leftmost pod was a vent for the "DirectAire" ventilation system. A clock was optional with the standard instrument package. The "Instrumentation Group", available on all V8 models, featured two large round pods centered on the steering wheel, containing the speedometer (with trip odometer) and a tachometer. A third equal sized pod on the left contained the DirectAire vent. The instrument cluster featured an ammeter, fuel gauge, temperature gauge, oil pressure gauge and clock in set of smaller stacked pods near the centre of the instrument panel. The seats were also new for 1972, the standard front bench seat had an integrated headrest for both outboard seating positions featuring, while the available high back buckets also featured integrated headrests. Ford continued to offer "comfort weave" vinyl seats as an option. These seats had the centre portion upholstered with a knitted vinyl material that allowed the upholstery to "breathe" unlike conventional vinyl. An optional 6-way power bench seat, replaced the 4-way seat offered in 1971. The Gran Torino Sport was offered as a 2-door hardtop and a 2-door SportsRoof. All Sport models featured an integrated hood scoop, which was only functional with the optional and rare Ram Air Induction system. Also included with this model was twin colour-keyed racing mirrors, moulded door panels (unique to the Sport model), body-side and wheel lip moldings, and F70-14 tires (E70-14 on hardtop models). A reflective laser stripe remained an option, and was revised to run the full length of the car. It replaced the chrome side molding, and was available in four colours to match the exterior paint. For the driving enthusiast, the "Rallye Equipment Group" included the Instrumentation Group, Competition Suspension, G70-14 tires with raised white letters, and a Hurst shifter for the 4-speed models (if so equipped). The Rallye Equipment Group was available with the 351CJ-4V or the 429-4V in Gran Torino Sport models. The Competition Suspension was highly regarded by Tom McCahill of Mechanix illustrated, as well as Motor Trend and Car and Driver as being less harsh than past Torino performance suspensions, while still offering excellent handling. Motor Trend described the suspension as "Unlike the super heavy-duty springs of years past, the folks at Ford have managed to produce superior ride control without harshness. It takes a ride in one [Torino] to truly appreciate it." Torino's new and improved chassis and suspension design can be attributed to this improvement. Torino wagons were much larger for 1972. Length increased by 2-inch (51 mm) for Torino models, and 6-inch (152 mm) for Gran Torinos. Wheelbase was up by 4-inch (102 mm), width increased by 3-inch (76 mm), and weight increased significantly. Torino station wagons could now carry a 4x8' sheet of plywood flat in the cargo area with the tailgate down. Station wagons had a rated capacity of 83.5 cu ft (2,364 L), nearing the capacity of some full-size wagons. An available rear-facing third seat was available, increasing the wagon's capacity from 6 to 8 passengers. All station wagons had the 3-way "Magic Doorgate", and a heavy-duty frame as standard equipment. The Squire models came standard with a luggage rack and simulated woodgrain panels that were slightly translucent, allowing some of the paint tint to show through. Torino wagons were often used to tow, but all Torino models could be equipped with an optional towing package. This included heavy-duty suspension, heavy-duty frame (standard on wagons), heavy-duty radiator and heavy-duty battery, along with a 3.25:1 axle and trailer wiring. This package allowed the Torino to tow up to 6,000 lb (2,700 kg) and required the 400-2V engine or larger. A light-duty trailer package which allowed towing up to 3,500 lb (1,600 kg) was also offered, and did not included the heavy-duty frame, and 3.25:1 axle. This package required the 351-2V or larger engine. 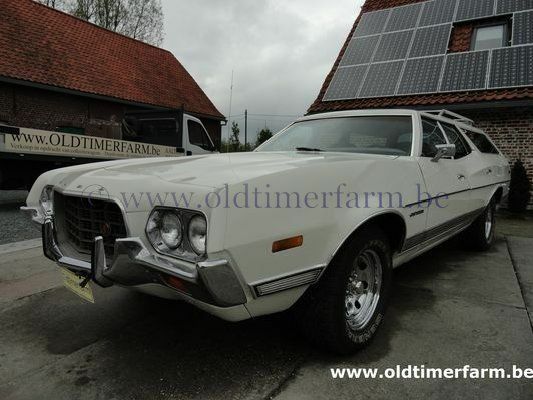 Overall, the 1972 Torino was a great success with the public and a total of 496,645 units were produced, making it the best-selling intermediate for 1972. This was the first time Ford had ever outsold the Chevrolet Chevelle since its 1964 introduction. Although there were no Torino Cobras like in past years, the Torino on average was a safer, quieter, better handling and better stopping car then ever before. The automotive press responded well to the all new Torino, and it received many positive reviews. In addition, Consumer Guide selected the Torino as a "Best Buy" for 1972. The 1972 Ford Gran Torino Sport SportsRoof was featured in the movie Gran Torino, directed by and starring Clint Eastwood. Bodywork. Length/width/height/wheelbase – cm(in)) : 546/2000/140/3000 (215/79/55/118); weight : 1858 kg (4096 lb). Engine. V8 6375 cc (389 ci), front mounted, 16 valves, LPG equipped, 3-speed manual gearbox, rear wheel drive. Maximum power : 195 bhp @ 4400 rpm. Top speed : 190 km/h (120 mph).